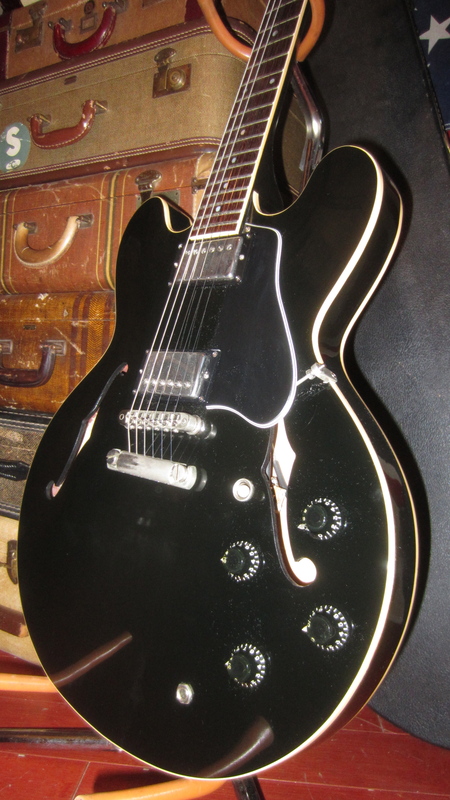 I just did a quick search on Gbase and came up with this uber cool factory black ’82. It’s just over $3K but Howie (at Rivington Guitars in New York) is a good guy and maybe he’ll sell it to you for $3K. 81-85s are an excellent choice for vintage on a budget. There’s a very flamey 85 on Ebay too that you might like for under $3000 too-if you like flamey. I got some less than friendly replies to my Big Bang, Little Bucks post and I think I deserved it. The guitars I described were in the $5000 range but, with repairs or upgrades got up in the $6500 range. The problem is that I called this amount “Little Bucks”. It’s not. $5000 is a load of money for a guitar to many folks and, because I sell and write about some mighty expensive guitars, I sometimes lose sight of the fact that the air is a bit rarefied in the 58-64 years. So are the prices. A vintage guitar, for almost all of us, is a luxury. Nobody has to have a vintage piece. Eric Clapton’s ‘burst was only 7 years old when he played with Mayall & Co. The argument that they “just don’t make ’em like they used to” doesn’t really apply any more. They (and I don’t mean Gibson, alone) make plenty of great guitars-some every bit as good as the ones I sell. I’ve made my point about “old wood” but you can still get a ton of tone out of a brand new or fairly new guitar that won’t cost you a years tuition at a major university. So, let’s look to see what you should buy if you have $3000 or less to spend and you want something old. I’m not going to talk about anything new because it isn’t my field. I’ve played a lot of the newer 335’s but you don’t need me to tell you which one to buy. Use your ears and your hands to figure out which one works for you. It’s a guitar, not an investment. Leave the investments to others if you don’t have the disposable income or assets to play that game. And ask them how they did on the guitars they bought in 2007-2008 when you get a chance. So, you have $3000 to spend on a guitar. Guitar Center has brand new 335’s for $2999. That’s the base model and it’s probably a pretty nice guitar although I haven’t played one. But you can get something vintage as well and it can be from the 60’s, 70’s or 80’s. It’s hard for old farts like me to believe but 1984 was almost 30 years ago. That makes those mid 80’s 335’s vintage. I particularly like the 81-85’s although the quality stays pretty much the same for the rest of the 80’s. Only the pickups change (and not for the better). The 81-85’s are the last of the Norlins and are quite good but they have also creeped up in price. You might find a blonde one under $3000-I have-but you’d be better off and so will your wallet if you look for another color. The black ones, although somewhat rare don’t seem to command a premium. I’ve seen a few under $2000. Reds and the somewhat dull sunbursts are easy to find in the $1800-$2400 range. They are generally well made and generally sound pretty good if a little dark. Change out the crappy harness with its 300K pots for a good one with 50-0K pots and it will brighten up. Make sure the Tim Shaw PAF reissues are still in there. I think they’re a little overrated but they are still good pickups. Some have big necks, some small, some three piece, some one piece…just make sure you know what you’re getting. Ask a lot of questions. 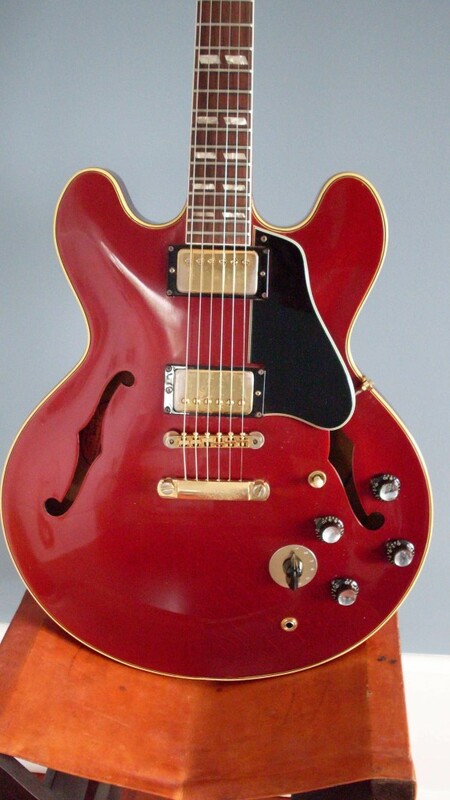 Next choice-a ’68 or early 69 ES-345. It’s going to have a narrow nut and if you can’t play a guitar with a skinny little 1 9/16″ nut, don’t buy one. You can’t fix it. Look to see whether it has a long neck tenon. All the 68’s do and some 69’s do. Avoid the ones where you can’t see the neck tenon sticking most of the way through the neck pickup rout. If you are able to play it in person, you can consider a later 69 but make sure the neck is stable. Some aren’t. 335’s from these years are pretty much out of your budget unless they are refinished or have neck breaks but 345’s with some minor issues (like added stop tails and changed tuners and harnesses) still turn up on Ebay, The Gear Page and Craigslist for $3000 or less. If you get lucky a 335 might turn up that you can negotiate down to that level. I was gonna talk about the 70’s but I’m out of space. Another time. This mid 60’s ES-345 had been stop tailed and Schallered and was that funny Sparkling Burgundy color but it played great and was cheap. Might have had changed pickups–Sold by me for exactly $3000. 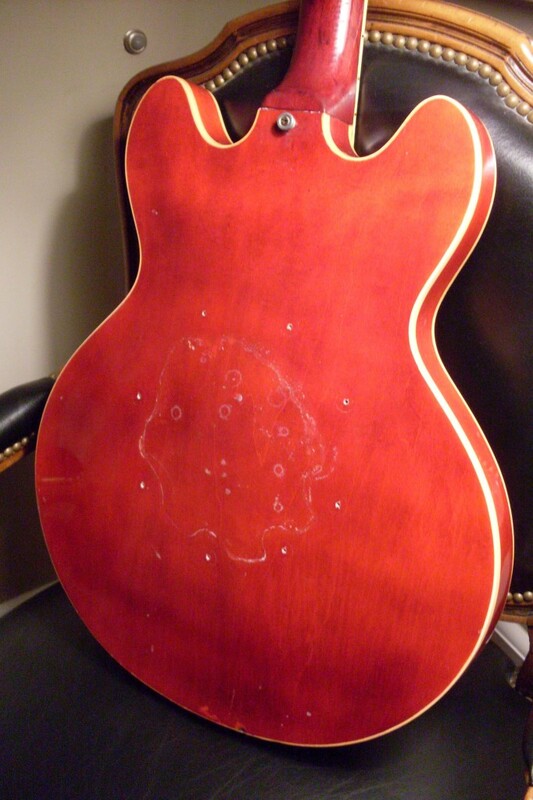 This 64 ES-345 was mostly original but it had a load of holes in it. It had been Schallered too but the price was around $5500 and that was in a fairly strong market. You can’t see all those holes while your playing it and they certainly don’t change the tone. And, it was played by Frank Sinatra’s guitar player (not the famous one). I’ve been a little remiss in doing the third part of my “Bang for the Buck” miniseries and I’ve had a few emails asking for the third installment. I actually covered a lot of the material in the “Old Wood” post since that is the key to getting your hands on a vintage piece without breaking the bank (or upsetting your wife). Take a quick look at a vintage 335. What parts are going to make a significant difference in the tone and playability of the guitar? Wait, don’t bother-I’ll tell you. The bridge, the nut, the strings, the wood and the pickups. Oh, and the design. The strings aren’t vintage so we can throw them out of the equation. A modern repro ABR-1 (or Tone Pros) will probably sound better than a vintage one since metal fatigue and wear take their toll over 50 years, so we can throw that out as well. The nut is important but it’s simply a piece of nylon and a properly cut new one will probably improve your guitar-whether it’s the same material or something else like bones or Tusq. That leaves us the wood and the pickups. And the design. I’m being a little simplistic here and not really taking into consideration the construction techniques-the glue, the hand work, etc. That’s important but we’re talking about vintage pieces here not trying to make a modern guitar sound like a vintage one. We want a vintage guitar that sounds like a vintage guitar for cheap. This leaves us with the body and neck and the electronics. Have you listened to some of the pickups out there? They are very close to PAFs. A good PAF and a particularly good boutique pickup are just about indistinguishable to my ears-which are pretty good ears. I can’t see worth a damn but I can hear. But, I have to say, a guitar that was just made doesn’t sound like an old one. I’ve put old parts on a Les Paul R9 including a set of PAFs, an original ABR-1, tuners, stop tail and harness. It sounded great but it didn’t sound that different from any other R9. I made the same point in my last post…an old guitar with new parts beats a new guitar with old parts as long as the old guitar is in good playing condition. It’s one of two things-either the wood itself is better or the passage of time has made the guitar sound better. I was there when these guitars were new-I played brand new 60’s ES-335’s (as early as 64) and if fuzzy memory is worth anything, they sounded pretty good right in the store. Take that for what it’s worth considering I can’t remember what I had for breakfast this morning. So, let’s say you have $5000 to spend. You can buy any of the new Gibson ES-335s from your local music store for that much, I think. I hear the new Memphis 335’s are quite good. But supposing you take $3500- $5000 and buy a boogered up 63 ES-345 with a load of holes in the top, maybe holes from a set of aftermarket tuners and maybe a minor repair that was well executed. It might have all the wrong parts on it but you can change those out over time. Bigsby or Maestro holes don’t change the tone or playability. Make absolutely certain that the neck is in good shape-no back bow, no twists. Make sure the truss works right. Good frets are important too unless you want to pay a few hundred bucks for a refret. Somebody stuck a set of tar backs or T-tops in there? Take em out if they sound bad and get a used set of SD’s or Fralins or Throbaks or Rolphs or any of a dozen other pickup winders. They don’t have to be the very expensive boutique pickups. Throw in a new harness from Mojotone or RS or Dr. Vintage if necessary. Get a repro ABR-1 from Tone Pros or Gibson if you want it to look correct. If the tuners work and they don’t bother you, leave ’em. A vintage set of Klusons will look right but an old set of Grovers will work better. By the time you’re done you’ve probably spent $4500-$6000 and your guitar will probably sound just about as good as my favorite 64 or 59. A great candidate is a big neck 65 335 or 345 that has had a Maestro or Bigsby removed. I’ve also seen a lot of 345’s from 60-64 that have all sorts of dreadful things done to them (59’s are always more money no matter what). I had one with no less than 29 filled holes in it-from a back pad, an arm rest, two or maybe three different trems, a moved bridge and two or three sets of tuners. It sounded great and didn’t really look all that bad from 3 feet away. And it had character. That’s gotta be worth something. And a refinish will cut the price in half and ,as long as it’s not covered with an eight of an inch of poly, it should sound pretty much the same. Stay away from bad repairs and bad necks and you will do fine. 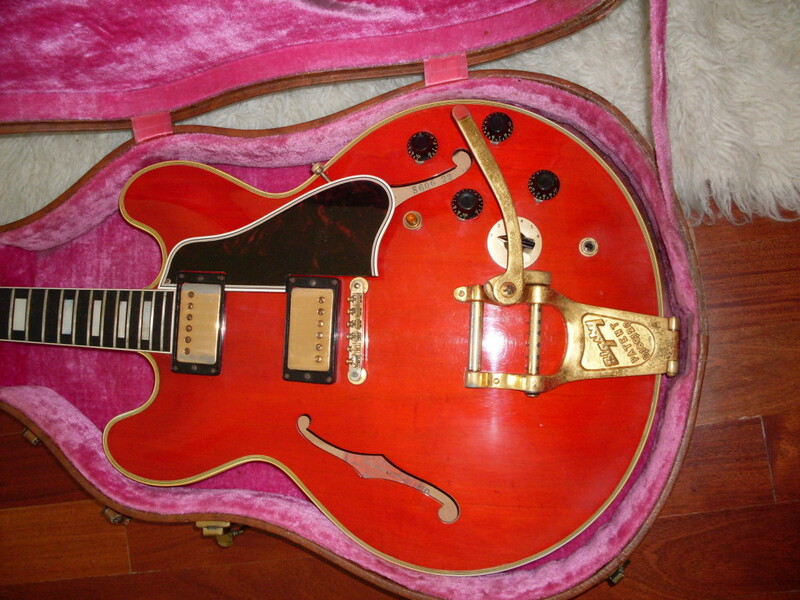 I think I bought this ’63 ES-345 for around $3000. It was refinished but still intact and it sounded pretty good even with a “dirty fingers” in the bridge and a T-top in the neck. It had a some original parts and a lot of changed ones. I’d take this over a new one any day. Even though virtually every part on this 1960 ES-345 has been changed, it’s still that elusive unobtainium called “old wood”. I guarantee that if you put old parts on a new body, it won’t sound as good as new parts on an old one. No, not the Rolling Stone with the same name, although he’s old Wood as well. Interestingly, Gibson and other manufacturers have gotten very close to being able to replicate all of the parts that make up a vintage guitar. For many of the parts, they don’t improve with age. This is true of most of the hardware. Certainly old Klusons are not better than new ones-in fact they can be pretty quirky. Old bridges tend to sag and I routinely replace the bridges in my players with Tone Pros or other aftermarket parts. The plastic repros are looking pretty authentic these days as are most of the metal parts. It’s actually getting hard to tell the high end aged repros from the vintage stuff. That’s good in a way and not so good in another. Parenthetical note: I can still tell the difference but I see about a zillion of every part every year. There is some discussion as to whether old pickups like PAFs and early patent numbers have improved with age. It may be that they were just better by accident due to the low tech winding and construction techniques used back then. Or they improve with age. I don’t know. What I do know is that there are some pickup winders out there who can get pretty darn close to a PAF. Everything but the sticker in some cases. I could name names but this post isn’t about pickups. This post is about the thing they can’t do. They can use the same grade of plywood and the old timey hide glue and the same specs but there are a few things they can’t do. They can’t use Brazilian rosewood, the can’t afford to do as much by hand and they can’t use old wood. As I’ve stated pretty clearly, I don’t think anybody can hear the difference between a Brazilian board and an Indian Rosewood board. Argue if you want, it only supports my larger point. Old wood sounds different than new wood. I think it generally sounds better and most players would agree with that. I don’t know if it’s because the wood dries out and becomes less dense or more dense and perhaps carries the sound differently or whether the glue hardens and the lacquer sinks in and the “relationship” between the wooden parts and the stuff that holds it together somehow coalesces to form something wonderful. I just don’t know. But I’m dead sure the old stuff sounds better than the new stuff and if the parts people could figure out a way to make new wood old, they would have done it already. But time is the thing you can’t fake. I suppose you could leave the plywood blanks in an open air barn in the Swiss Alps and let the breeze blow through it for a few years but they don’t. It would be expensive. They would rather kiln dry it or perhaps not dry it at all. That’s not how new wood gets to be old wood. New wood gets to be old wood the same way young Ron Wood got to be old Ron Wood. Time. Think about this. Which would you rather have (and which would sound better? 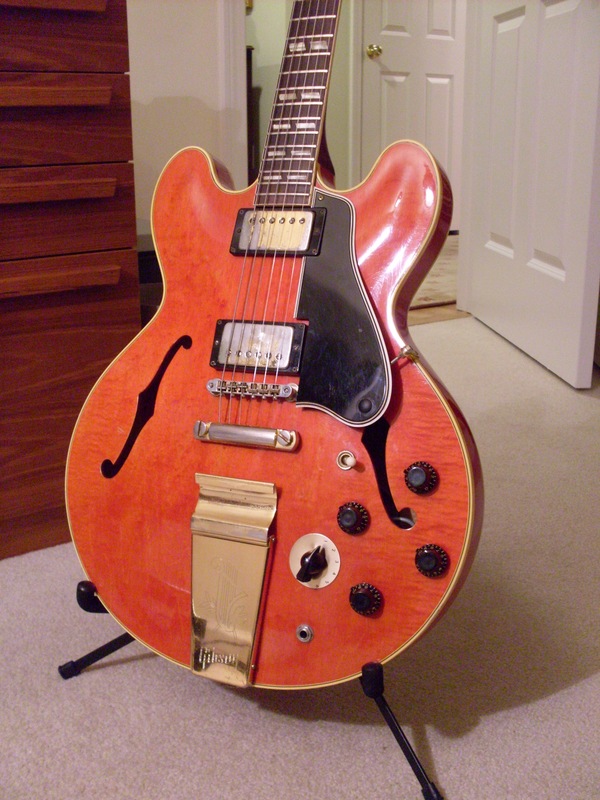 )–a ’58 ES-335 with new parts or a ’13 ES-335 with old parts? No brainer. A couple of bees I pulled from the internet. The one on the left is paper in oil and the one on the right is mylar film. VINTAGE TONE!!! TONE FOR DAYS!!! You know all the pimply faced hyperbole by now. If you read ads on Ebay for capacitors (and believe them) you’d think a bumblebee cap is the secret weapon of great sounding guitars. It isn’t. The capacitor comes into play but not in a way that will make a bad sounding guitar into a good one. If you’re one of those players who keeps the tone pot dimed, this doesn’t even concern you. But if you actually use the tone knob on your guitar, it’s worth knowing something about capacitors. There are only two of them in a 335 and they are part of the tone circuit. There are something like 14 of them is an ES-345 but all but two are in the Varitone. It’s the two that are attached to the tone pot that we’re going to look at. You’ve all heard the Les Paul guys going nuts over their bumblebees and how you can’t have “vintage tone” without them. Yes, it’s nice to have vintage parts (or even repro ones) in your reissue guitar but a couple of overpriced ’50’s bumblebees isn’t going to appreciably change the tone of your guitar. They may change the response of your tone control though. 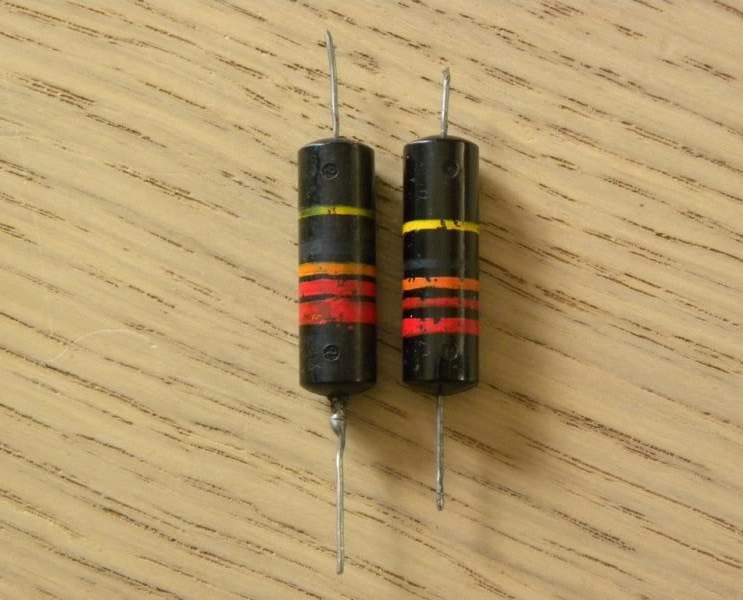 The way I understand it, the capacitor really only affects the taper (response) of the tone control. Maybe the bass will come on sooner or the treble will roll off later-you’ll just have to experiment. There are plenty of youtube videos that do this. I don’t really have the qualifications to explain how various caps will affect your tone but I can tell you what’s supposed to be in there if you are so brave as to pull the harness on your 335. Actually, you don’t have to because you can usually see the caps through the f-holes. Gibson, as usual, used a number of suppliers for their components and those suppliers sometimes changed their products or discontinued them forcing their customers to change along with them. We’ll look at 335’s (and mono 355’s) first. Starting in ’58, Gibson used .022 mfd Sprague bumblebee paper in oil (PIO) caps but the technology took a leap forward very shortly after that. By late 58, Bumblebees were mylar film based. ’58 ES-335s and 355’s (which were all mono) are the only semi hollows that used PIO caps. Every 59 I’ve looked at has the later mylar film type and some late 58’s as well. Still bumblebees but not PIO. That goes for ‘bursts too, by the way. That 59 burst you lust after probably has mylar caps. The conventional geek wisdom is that PIO is better. I’ll stay out of that debate. Look for the little filler cup at one end. No filler cup? Not PIO…simple as that. But the value is the same .022 mfd. Sprague “Black Beauty” cap out of a 65 ES-335. Seems easier to tell the value when its written in English. The bumblebees do look cooler though. By 1961, the bumblebees were gone and the replacement-from the same manufacturer, Sprague, looked a bit different. It was still a .022 mfd mylar film capacitor but it no longer had it’s bumblebee stripes. It was simply black with thevalues in big red letters rather than in coded stripes. Brilliant. These have taken on the moniker of “black beauty” although they get to share their nickname with a certain type of amphetamine that was popular when I was in college back in the Middle Ages. The 335s are pretty consistent up through 64 but then some other types started showing up but that’s for another day. You can experiment with different values and see what happens but I don’t suggest pulling the caps on your all original vintage 335. You’ll have to pull the harness (no fun) and you’ll diminish the vintage value of your guitar –all for a very small result. We’ll leave the later ones alone for now and look at the 345’s and stereo 355’s from 59 through 64. These are different. For some reason, which I’ve never quite been able to fathom, the stereo guitars were built with shielding cans presumably to minimize hum. It makes some sense but it seems that the shielding can intended for the tone control on a 345 or 355 won’t fit because the pot is too close to the rim of the guitar. Oops. So, they leave off the fourth can. Because there are cans, I guess they needed to use a capacitor that would fit inside the cans. That would be the ceramic disc type that we’re all familiar with. Most people will agree that these are inferior but I have no idea why. I’m not sure which types drift more easily or drift more or drift sooner but that could be a factor. The bottom line here is if it ain’t broke…Unless you are experiencing real issues with your tone controls (and you use them a lot) I would leave the caps alone. If your 335 sounds like crap, a cap change isn’t going to fix it. Thanks to Josh L. for suggesting the topic. 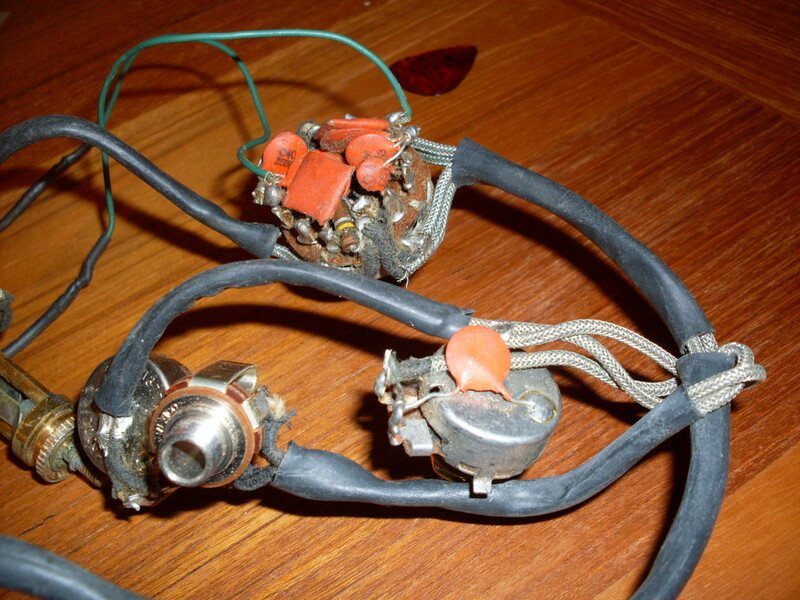 This is the harness out of a ’60 ES-355 stereo with the shielding cans removed. You can see the cap on the tone pot is a very compact ceramic disc-used so it will fit into the can. The value is the same as the bees and the beauties. The values are printed on the other side. 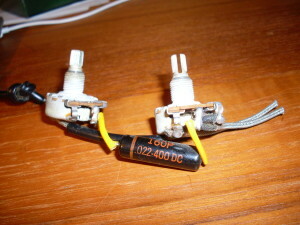 The others, on the Varitone switch, are the same type. Here’s a FON, clear as day. They aren’t always so clear. This is a three digit “rack” or “batch” number so I guess they exist. The “S” means the build process began in 1959 even if the serial number says otherwise. I’ve been trying to make some sense out the relationship between serial numbers and factory order numbers (FONs). I wrote about these mysterious numbers in June of 2012 and was more confused than enlightened by my research. So, I’m putting them all into a spreadsheet and trying to make some order out of the apparent chaos. I’m only going to look at 1958 through 1961 since those are the only years relevant to ES 335/345/355 guitars. They stopped using the FON in 61, so we don’t need to go any farther than that. Here’s what we know about them. They are sequential. They begin with a letter which designates the year (going backwards in the alphabet from Z to Q which is 1952-1961). Following the letter prefix was a three or four digit number known as the “rack” or “batch” number. I’ve read that they started at 1000 and went through 9999 and started over again. I’ve also read that they started at 100 and, until recently, I never saw a three digit FON but now I have . Among the guitars I have catalogued, shortly after FON S9xxx is S6xx and shortly after that S9xx. So, it appears that they actually do go back to 100. What is most important about these numbers is that they represent the beginning of the process of building the guitars and not the shipping date which is really what the serial number and Gibson shipping logs will tell you. It really depends on how much information you actually want or need. Mostly, it doesn’t really make a whole lot of difference whether your guitar was built in July and shipped in August but for low volume models, the FON can tell you a lot. That’s because the amount of time that may have passed between manufacture and assembly and shipping could be years. You heard right. Years. It’s not common for ES 335s to have sat around waiting to be sold since they were always pretty popular but models like ES-350s and Byrdlands and ES-5’s could have a very long wait between the build date and the shipping date. There are notable exceptions. I recently sold a 335 with a ’62 serial number but a “R” factory order number. “R” designates the guitar was built in 1960. It has some odd finish issues so it may have initially been rejected and used later. This is the kind of stuff I’m trying to figure out. 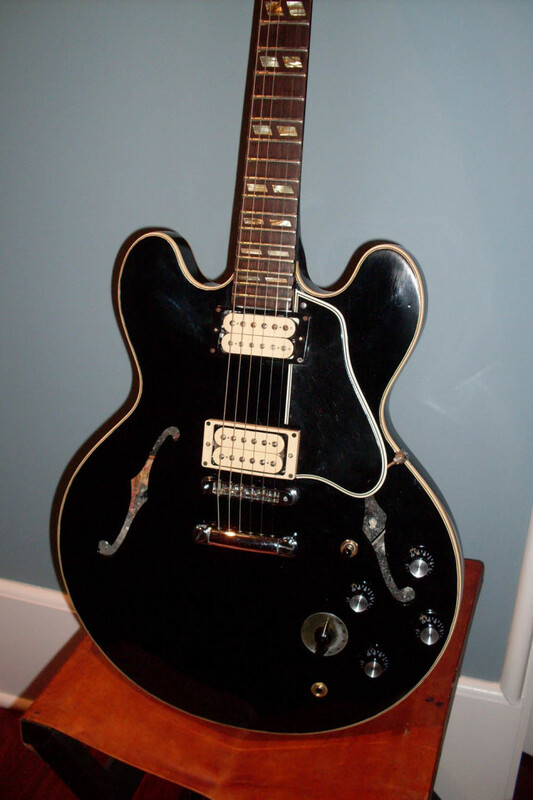 Another good example is a mono ES-355 I had with the serial number well into 1959-A30659. But it had a FON that began with “T” making it from a ’58 rack. Interestingly, it had a huge 58 like neck and the thinner top of a 58 build. Most 59 ES 355’s have a fairly slim neck (unlike most 335s and 345s). Granted, this is something of an exercise is minutia but I have nothing better to do today (it’s cold, it’s raining and it’s Sunday-and I don’t like football). FONs are particularly useful when a guitar is on the cusp of a transition-like an early 60. Even if the serial number indicates a later 60, the FON may tip you off to some earlier features. 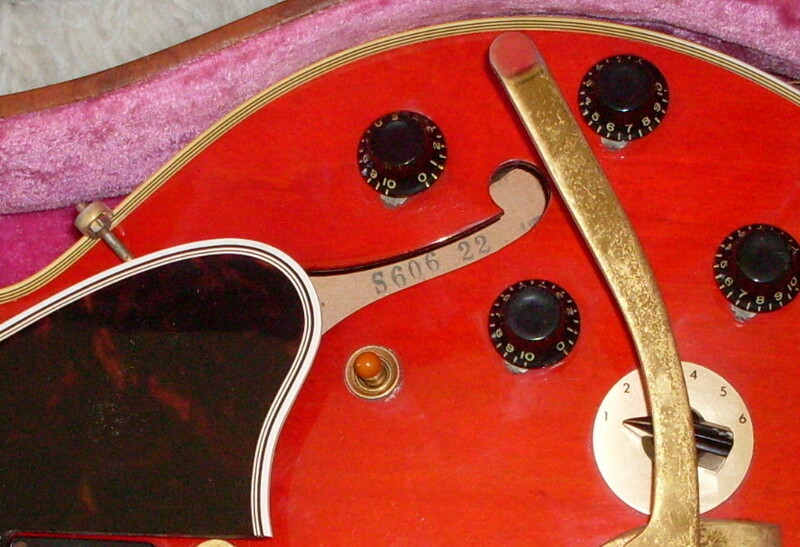 My ’60 ES-345 TDN had a January serial number but it had an “S” FON so I know it was built in 1959. That made it more desirable to my buyer and it justified the 59 knobs and transitional neck profile. The conventional wisdom in dating these guitars is to use the serial number-I get that. But I think the FON will be more accurate in predicting the features and measurements and give you-the player, the buyer, the collector-more ammo when it comes to buying a guitar sight unseen. So, PLEASE, if you own a 58-61 ES-335/345/355, email me the serial, the FON, the model and a short description. You and your guitar will remain completely anonymous. I will publish the database when I reach around 500 guitars. It will only note the serial, the FON, the model and a few features (stop tail or Bigsby, etc. or anything unusual). You can email me at okguitars@gmail.com. And thank you. 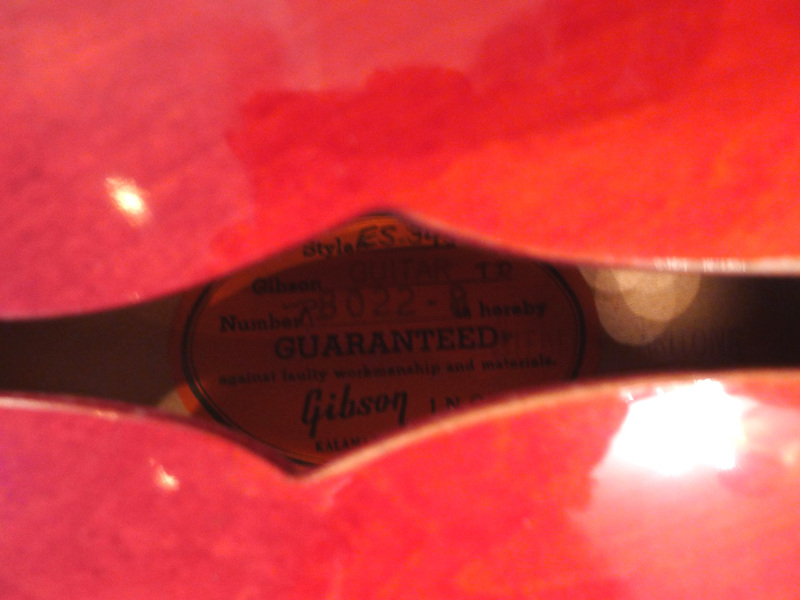 Excuse the crappy photo but this 1960 ES-345 has it’s FON on the label as its serial number. Maybe it was the guy’s first day on the job. Never seen another like it.